In this project we investigate the sounds of agricultural environments and how these sounds are related to agroecosystem rhythm, function and change. We make brief audio recordings at regular intervals over extended periods of time and then analyze them to reveal the information they contain. 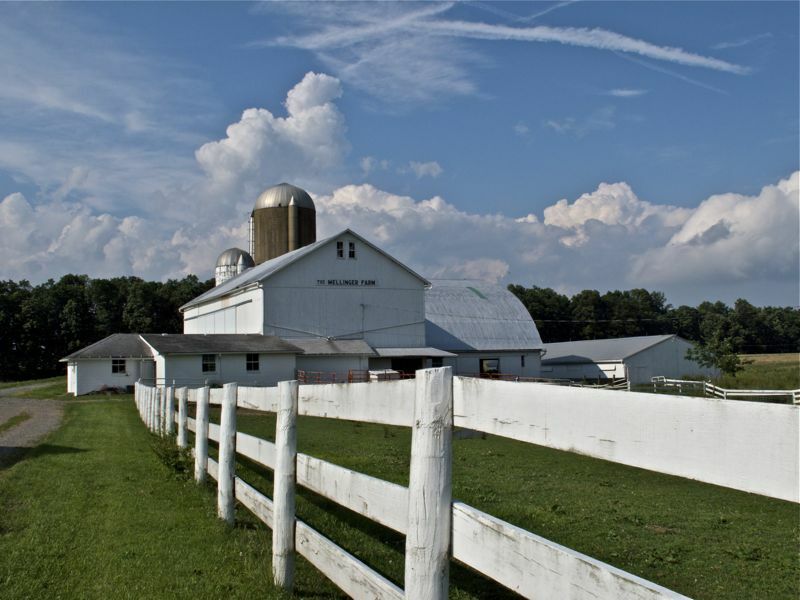 The Mellinger Farm is a 300 acre farm west of Wooster presently being farmed on contract in a corn and soybean rotation. 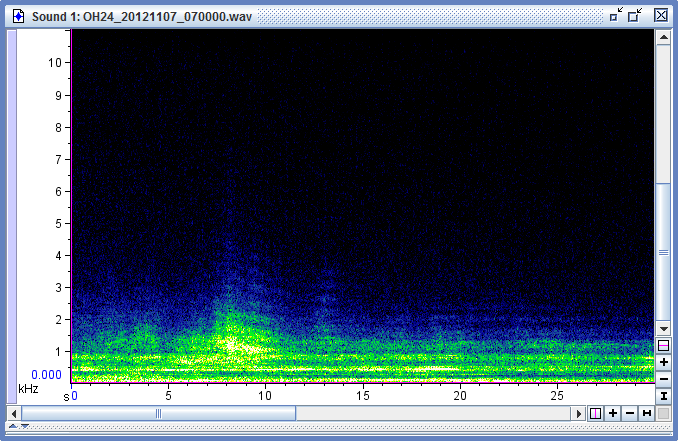 We have two recorders located on this farm. One, near the barn and other buildings, is sheltered from the wind, has little vegetation other than lawn, and, because the farmland is rented, there is little activity around the barn. The other is located in a brushy drainage-way between two cultivated fields. 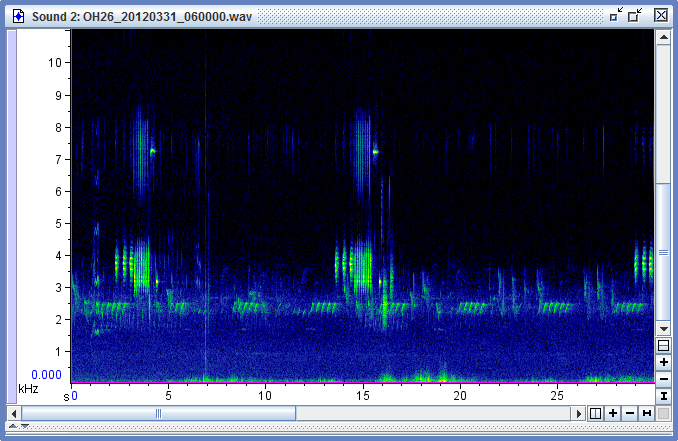 In the example sounds below, we show a visual image of the sound called a spectrogram along with an audio player for you to listen to the sound. By recording sound over extended periods we can discover daily, seasonal, and annual rhythms in the ecosystem. Using a method we developed, we compress the over 1400 thirty second recordings made each month into monthly spectrograms. 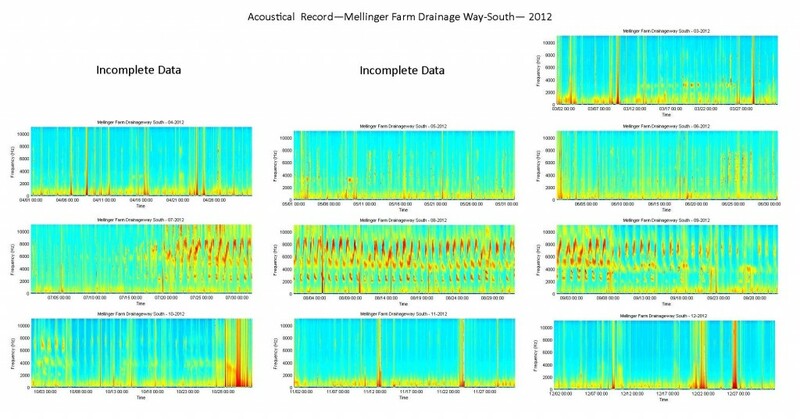 In the illustrations below the twelve monthly spectrograms for the year of 2012 are plotted on a panel for each habitat showing the similarities and differences between them. Each panel summarizes 17,568 audio recordings for a total of 146.4 hours evenly distributed over the year and comprising over 22 gigabytes of data for the habitat. The first panel, for the drainage-way habitat, shows the dominance of insect sounds beginning in mid-July and extending into early October as its most striking acoustical feature . Several storm events are also very obvious, particularly in the last quarter of the year. Closer inspection shows the sounds of frogs and toads on spring evenings and birds singing in the spring and summer. 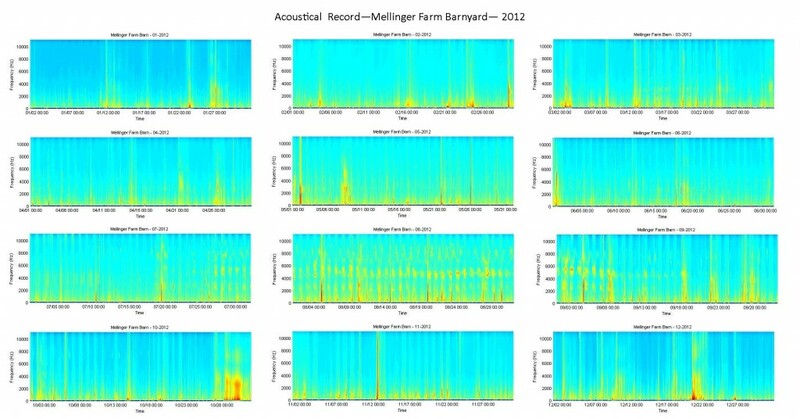 The second panel is the collection of monthly spectrograms from made from recordings in the barnyard habitat. Because of its sheltered location and landscaped environment, the sounds are much more subdued. The mid-summer insects and storms are still present but less intense. The monthly spectrograms show significant rhythms and changes in the sound of the ecosystem but to understand what is actually changing we need to look at the finer detail of the sound spectra. In this section we will do that with selected examples from both habitats. Scroll down the page to listen to all of the sounds or click here for a list to jump to specific sounds. 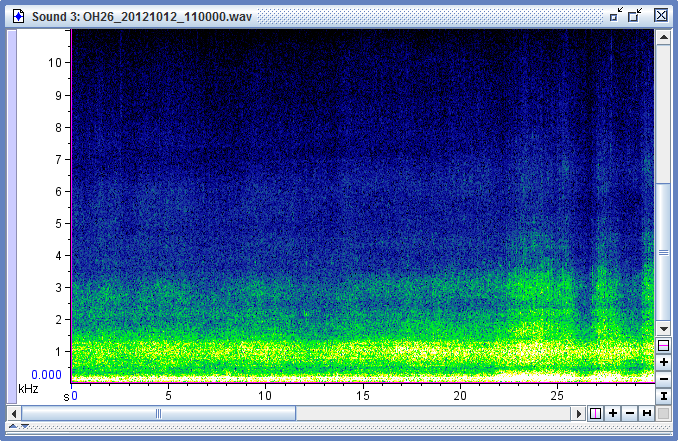 The spectrogram is a visual representation of the sound recording. In it the time during the recording is shown progressing from left to right along the horizontal axis. The frequency components of the sound at each time is shown along the vertical axis with low frequencies at the bottom and high frequencies at the top. The amplitude or intensity of the sound at each time and frequency is represented by the color with brighter colors indicating the more intense sounds. 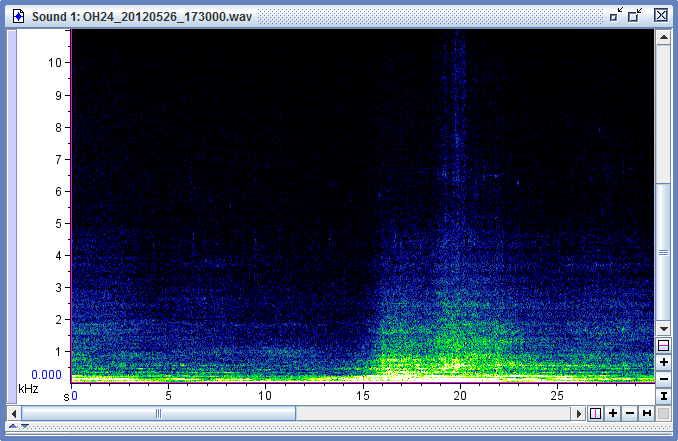 When you click the play icon on the Audio Player you will notice that the playback time indicates the location on the Time axis on the accompanying spectrogram. 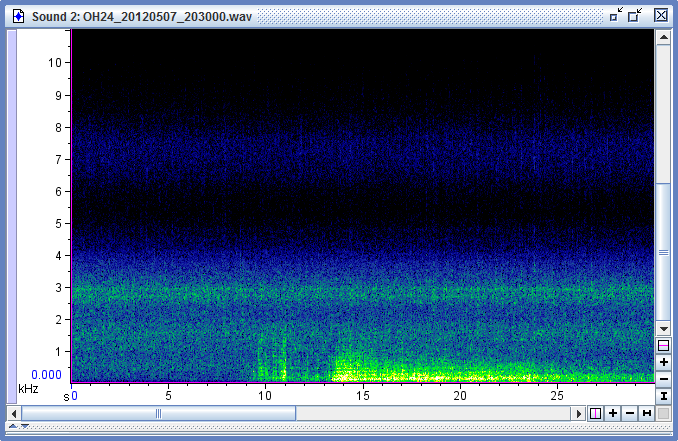 If there is an interesting feature on the spectrogram at 10 seconds listen for it when the playback time is 10 seconds. Beginning around March 13 we hear sounds in a narrow frequency band centered near 3200 Hz that are strongest during the evening hours becoming quite intense on three successive evenings. These are spring peepers vocalizing during a period of unseasonably warm temperatures. Toads can also be heard trilling on those three days at a lower frequency around 2000 Hz along with the sound of traffic on US Rt 30 in the background. A sample of those sounds is included below from March 20 at 22:30. 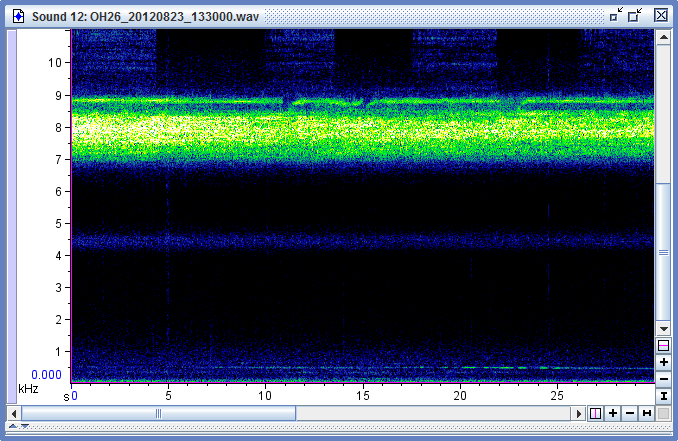 While not presenting an interesting or particularly noticeable spectrogram a brief rain shower early in the month resulted an interesting recording, especially when the next sound, of rainwater runoff, is considered. On March 02 light rain began at about 17:30 and continued for about an hour, accumulating about 0.4 inch. Recording made at 18:00 on March 02. At 18:30 on March 02 we hear runoff water beginning to flow in the drainage-way, reaching perhaps a maximum at 19:30 with the sound continuing at a diminishing rate through the night until 5:00 or 6:00 the next morning. The rapid development of flowing water may be attributed to already saturated soil from previous rain events, lack of cover crop, and moderate to cool temperatures slowing evaporation. A similar rain event later in the month during a dryer, warmer and windier period did not promote audible runoff flow. Recording made at 19:30 on March 02. The brushy habitat of the drainage-way and nearby trees host a variety of birds. This example was recorded at 06:00 on March 31 and includes some low frequency wind noise. Beginning in mid-July and extending through mid-October, insects dominate the sounds of the drainage-way habitat due to their large populations, proximity to the microphone, and in some species, inherently intense vocalizations. Notice that compared to the nighttime insects, the midday vocalizations are at a higher frequency. 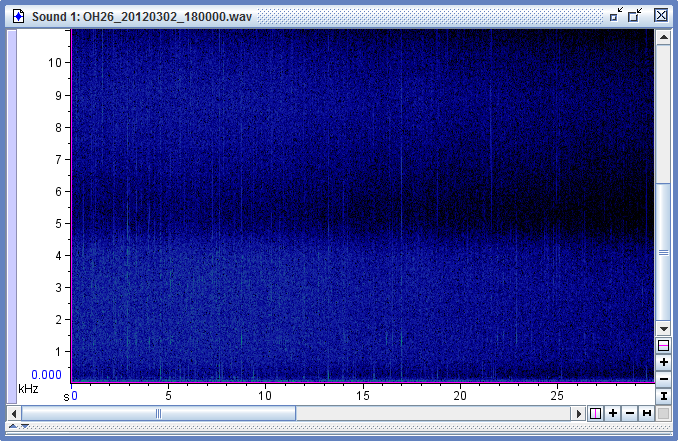 This is an example from the recording at 13:30 on August 23. Beginning in mid-July and extending through mid-October, insects dominate the nighttime sounds of the drainage-way habitat due to their large populations, proximity to the microphone, and in some species, inherently intense vocalizations. This example is from the recording made at 22:00 on August 23 and contains considerable background sound from traffic on Rt. 30. The sound of farm machinery appears in only a small number of recordings during the year. When nearby, the machinery may contain significant mid to high frequency content which diminishes rapidly with distance. While the considerable low frequency components tend to travel further, they combine rather quickly with other low frequency background sounds, making them difficult to identify. This example was recorded at 11:00 on October 12. Unlike the drainage-way, the barnyard does not provide good habitat for frogs and vocalizing toads. The spring peepers in this recording may reside in a more suitable habitat some distance away across the barnyard from the microphone and are heard against the low frequency background of distant traffic on Rt. 30. Example recorded at 19:00 on March 19. The only habitat for birds in the barnyard is in the old corn crib and nearby equipment sheds resulting in a more limited variety of bird species. Also in this recording is a small gust of wind at about the ten second mark. Example recorded at 06:00 on March 31. The metal roof on a nearby equipment shed in the barnyard imparts a different sound to falling rain than the vegetation in the drainage-way. Recorded at 20:30 on May 07. Like the sound of the farm machinery, the sound of lawn maintenance in the barnyard area is brief and difficult to pick out in the monthly spectrograms. The lawn area near the microphone could easily be mowed between recordings and with buildings shielding the microphone from the direct mower sound in other parts of the barnyard it is conceivable that entire mowing events could be absent from the recording set. 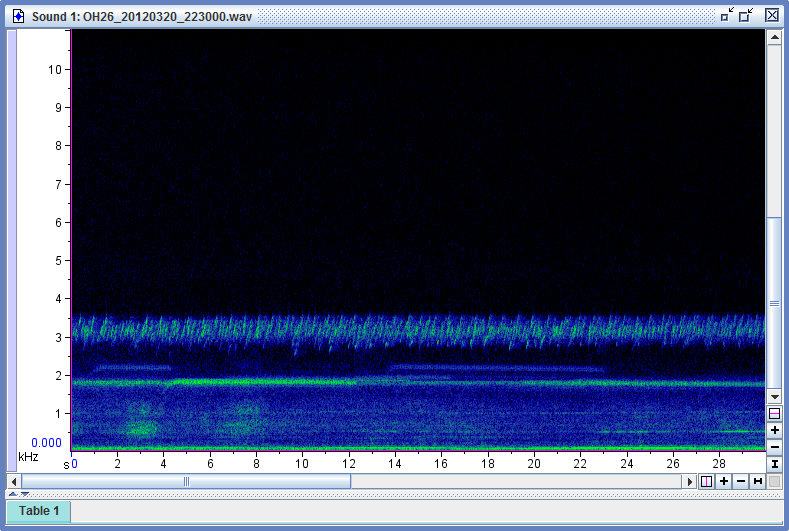 Example recorded at 17:30 on May 26. While not comparable to the extensive vegetation in the drainage-way there is a small patch of uncut grasses and other vegetation near the microphone and a few large trees across the barnyard that may provide habitat for the few insects we hear there. The sound is almost inaudible due to low intensity and high frequency. Recording made at 13:30 on August 23. 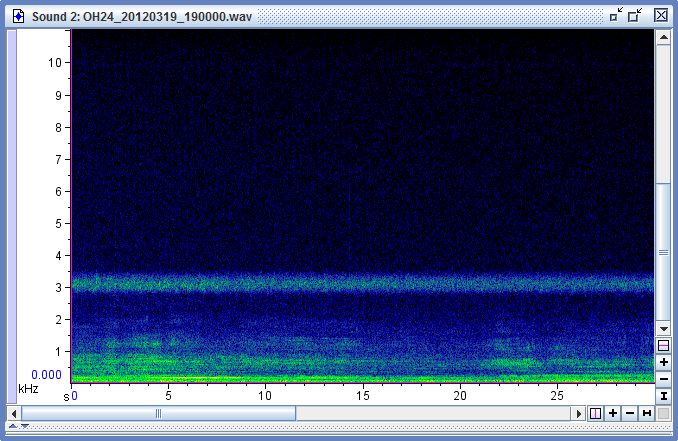 In this recording we hear the sound of insects in the evening against the background sound of traffic on Rt. 30. In this recording we hear the sound of a vehicle passing by the farm against the background sound of distant traffic on Rt. 30. 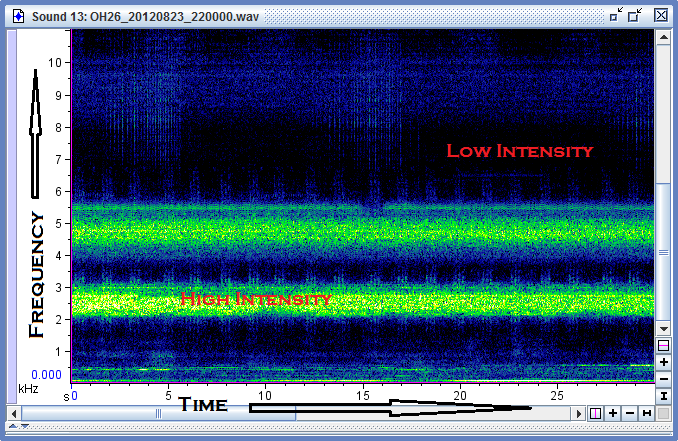 The low frequency sounds that form somewhat uniform lines parallel to the horizontal axis of the spectrogram are associated with the distant traffic while the family of curves and the sudden increase in intensity at about 8 seconds is associated with the local traffic on the road in front of the farm house.